Nice GUI, Lots of useful tools. 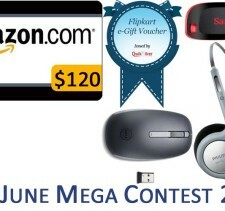 All option are easily accessible with just 2 Clicks. 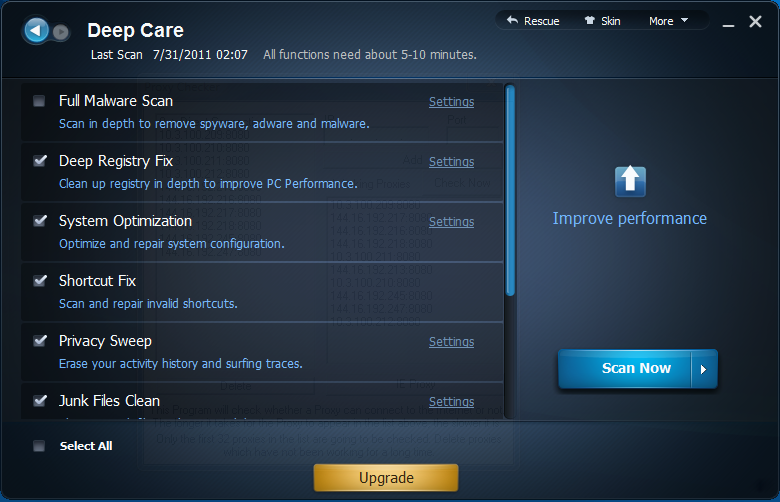 Advanced SystemCare is a nice freeware providing what paid utilities can’t do. It provides so many tools and feature which help you to take care of your Windows PC. It has a nice GUI and very easy to use. Just give this tool a try and your computer is always running at its top. 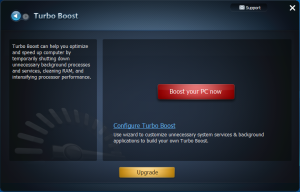 No matter how much good hardware you stuff into your PC, your Windows PC will start to feel sluggish in a month or so. You will find that your your Windows computer is not responding as fast as it responded when you first brought it. Some programs might have started using more system resource then they should. What happening to your Windows PC is that, many unused registry, temporary files etc are being created as you use many applications and install many tools. When you start moving and copying stuffs, fragmentation of data clusters takes place, which is bad for accessing information. It slows the response time of your computer. Also there are many security loopholes present. After using your computer for so long junk files accumulates using up free spaces. Well the answer is simple, your take care of your Windows computer. It is the same as – you buy a new care and you need to service it regularly so that it keeps on running and give good mileage. 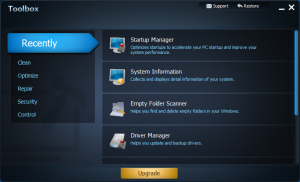 There is one awesome windows tool which do this best – Advanced SystemCare by IObit. It is a freeware. It also has a Pro version with additional features and extra tools. You can easily get Advanced SystemCare Pro from IObit or on Amazon . But if you are a home user you will never need the Pro version as the Freeware version is quite sufficient. Advanced SystemCare 4.10 version is Windows only tool and it run successfully on Windows 2000, Windows XP SP3 (both 32-bit and 64 bit System) , Windows Vista (32-bit and 64-bit of all versions) and Windows 7 ( 32-bit and 64-bit of all versions). I currently run Advanced SystemCare on my Laptop which runs 64-bit Windows 7 Home Premium and on my Desktop PC which runs 32-bit Windows 7 Ultimate. It runs smoothly on both the systems. It also uses very less resource itself making it a very good utility. On left is screenshot of Deep Care windows. Advanced SystemCare has two care options - Quick Care and Deep Care. 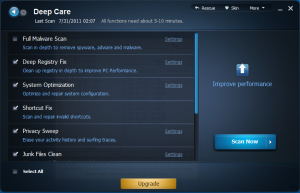 Quick Care does Quick Malware Scan, Registry Fix, Shortcut Fix, Privacy Sweep, Junk Files Clean. It is faster than Deep Care option as it do not go deep into the system. Correct and Fix the problems. 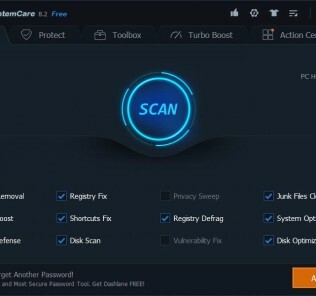 The Deep Care does Full Malware Scan, Deep Registry Fix, System Optimization, Shortcut Fix, Privacy Sweep, Junk Files Clean, Passive Defense, Disk Scan, Vulnerability Fix and Disk Defragment. You only need to use Deep Care only once in a while. 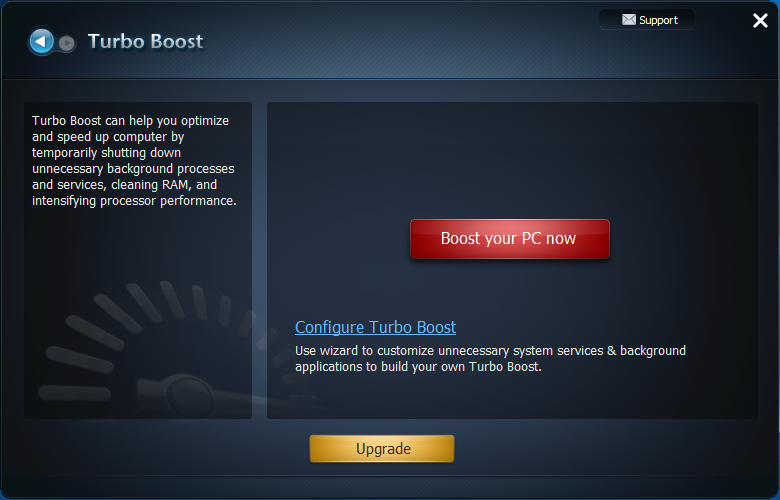 Advanced SystemCare also has a Turbo Boost option. It make your system faster. It disables unused background services and process. It also gives you option to disable Aero and high resource using Theme. It frees up system resource thus enabling you to give you applications more RAM and Processor speed. You can also use it as your Game Booster. Will help you to run Games and Applications better with less lags. IObit Uninstaller - To uninstall software which have problem uninstalling. Now those are lots of tools. Many of these will be really useful. 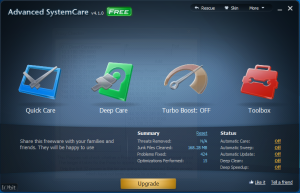 Advanced SystemCare is a nice freeware providing what paid utilities can’t do. 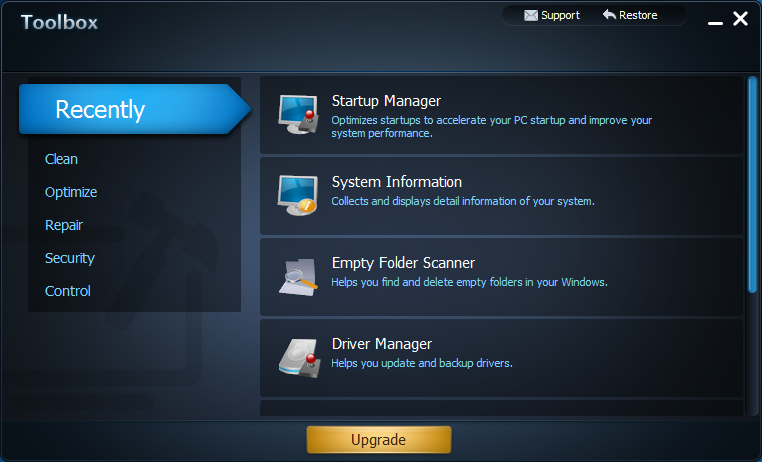 It provides so many tools and feature which help you to take care of your Windows PC. Has a nice GUI and very easy to use. Just give this tool a try and your computer is always running at its top. The Views, Opinions or Recommendations provided in this Review of said product are that of the Author and not of the whole Geeks Column Website in particular. Do provide your own valuable reviews by filling in the comment section with your views, ratings, positives & negatives if you have used the said product. I need this for my PC.